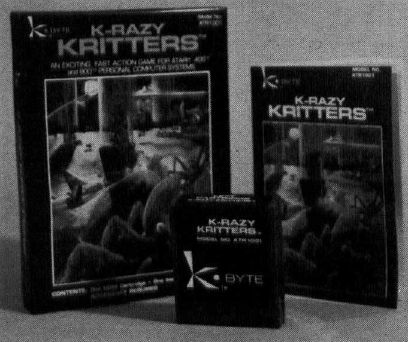 K-Razy Kritters defies personal computer enthusiasts to save the Command Ships through ten increasingly difficult levels of play. This challenging game, in ROM Cartridge form, is for Atari 400 and 800 personal computers. Each cartridge is tested to assure product reliability and customer satisfaction. The full-color, creatively designed package is shrink-wrapped for product protection and consumer appeal to entice sales. Each package contains a 12-page, full-color Instruction Booklet with graphics and complete rules of the game.